A bird’s-eye view can completely change your perspective on things. And I mean that literally. 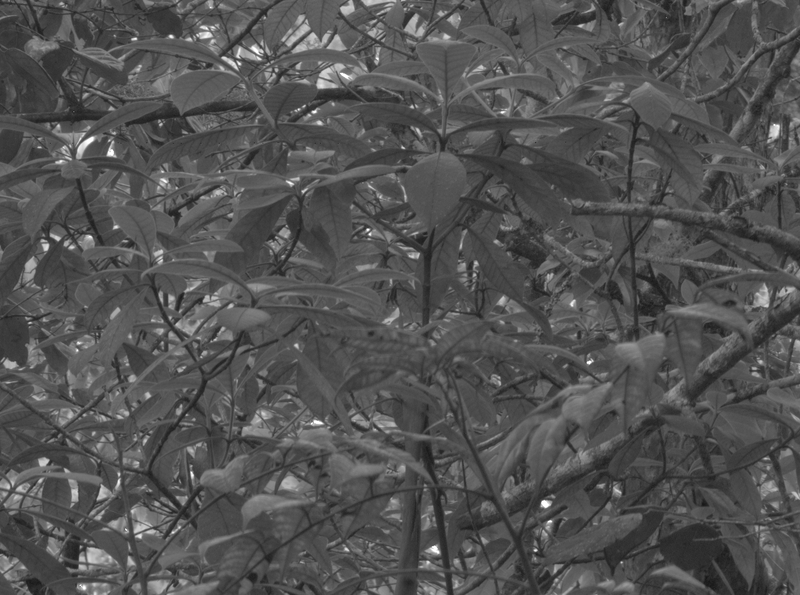 A pair of European researchers used a specially configured camera and took pictures of trees in order to see vegetation the way that birds do. They think that their results unveil the hidden importance of ultraviolet vision, and could offer an improved understanding of how vision evolved across species. “We were able to discover a phenomenon that, in retrospect, seems obvious, but which no previous study had the methodological capability or foresight to look for,” the authors write in the study published in Nature Communications. The third column, which represents how birds see the world, has the most contrast, demonstrating the importance of ultraviolet light. The fourth column is how the trees appear to human eyes. Eyes, like computer printers, create images by combining a selection of primary colours. But rather than three ink cartridges, eyes have a series of light-receiving cones that detect light of certain colours, or wavelengths. Humans have three kinds of cone cells that detect three wavelengths: blue, green, and red. Some animals, including birds, have another set of cones that respond to ultraviolet light, colours that are beyond the range of what humans can see. But why would an animal need ultraviolet vision? That was what the researchers wanted to figure out. They photographed vegetation using a camera that captured and filtered both visible and ultraviolet light. To make sense of the colour images, they had the ultraviolet light appear as red, revealing how the addition of UV light adds greater contrast to a scene that appears as nearly all green to human eyes. 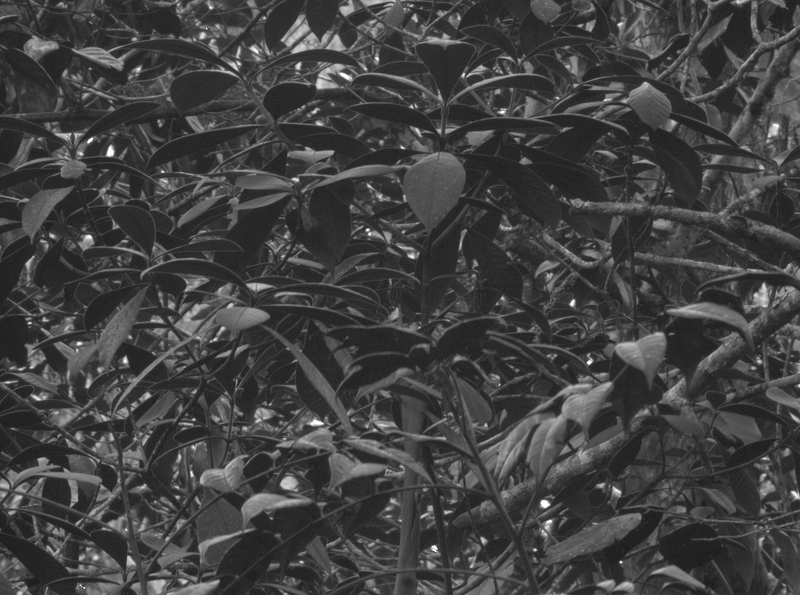 The black-and-white image above shows the vegetation as it appears in only the ultraviolet spectrum, again revealing higher contrast than what human eyes alone would see. 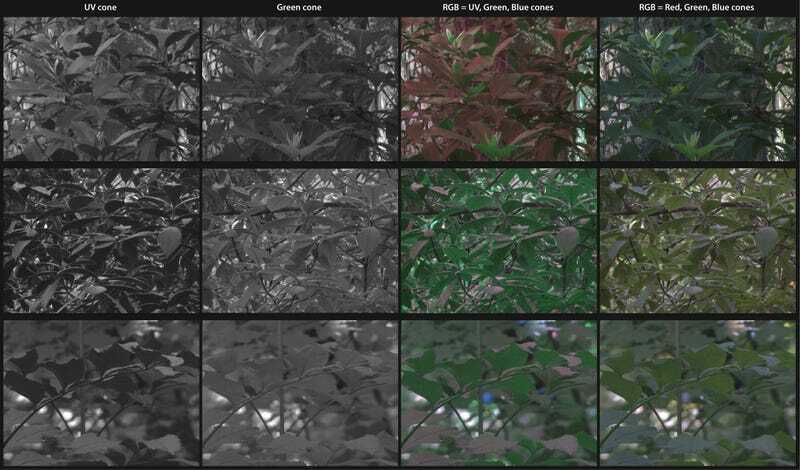 The researchers’ images show that ultraviolet light added new detail to leaves that made them easier to discern. Green was “surprisingly unhelpful” for telling apart different surfaces of the leaves compared to ultraviolet, according to paper. This was surprising, because leaves don’t reflect as much UV light as they do other colours, so the scientists didn’t expect to see the dramatic differences. There isn’t just one kind of ultraviolet vision, either—most land birds’ fourth type of cone cell can see one of two ultraviolet wavelengths. The images showed that each of these wavelengths seemed to create higher-contrast images in different forest environments, one with open canopies and the other in closed canopies like rainforests. Of course, we’ll never know exactly how birds see the world, because we’re humans with three kinds of cone cells, not birds with four kinds of cone cells. But it’s a cool result, mainly because it gave the scientists as close to a bird’s-eye view of the world as they could get. And perhaps this technique will reveal more things about eyesight across species in the future.